How to Build a Raised Planter | KaBOOM! 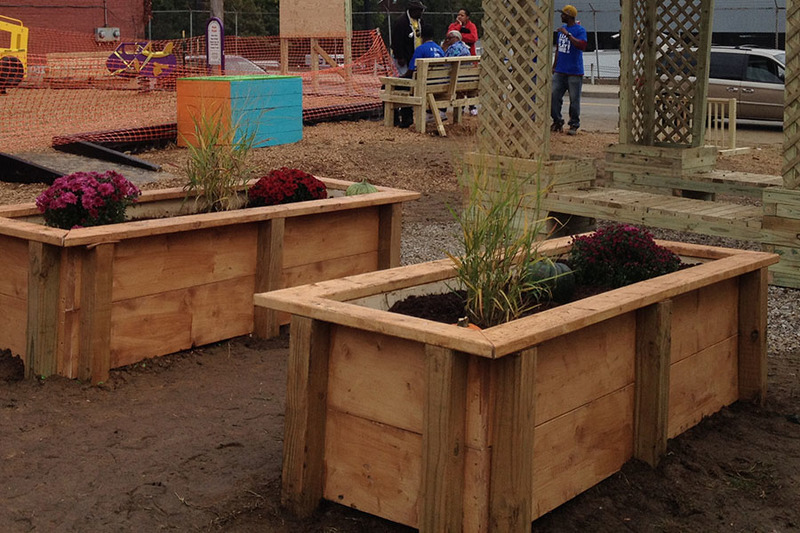 Adding garden beds to your playspace gives children the opportunity to learn more about where food comes from and how vegetables and flowers grow. Edible plants can add many great sensory elements to enhance your space! Take the  2x12x10' boards. Cut each into  86" piece and  29" piece, for a total of  2x12x86" pieces and  2x12x29" pieces. Take the  4x4x12' boards. Cut each into  27" pieces, for a total of  4x4x27" pieces. Take the  2x6x12' boards. Cut each into  96" piece and  36" piece, for a total of  2x6x96" pieces and  2x6x36" pieces. Take the  2x6x96" pieces cut in step 4. Set the miter saw to 45° and cut an angle off both ends, creating  2x6x96" trapezoids. Take the  2x6x36" pieces cut in step 4. Keeping the miter saw at 45°, cut an angle off both ends, creating  2x6x36" trapezoids. Take  2x12x86" pieces and the  2x12x29" pieces and assemble a rectangular box with the 29" pieces on the outside, as shown. Attach each corner with three screws. 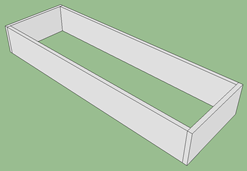 Attach the  4x4x27" posts to the 29"x86" box, as shown. These posts will go on the outside of the box. Eight of the posts will sit 3" off from the corners of your box. 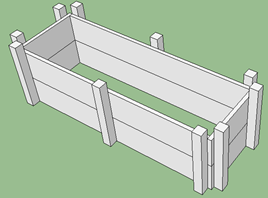 The remaining two posts should be placed in the middle (3' and 7") of the long sides, with an equal distance to the corner posts from each. Attach each of these posts with  screws. 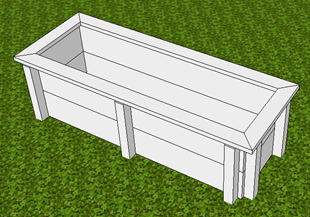 Take the remaining  2x12x86" and  2x12x29" pieces of wood for the second level of the box. Build this level inside of the 4x4 posts. Start by putting all four pieces of wood into place, keeping the 29" pieces on the outside. Once they are in place, attach the four corners of the box with 3" screws. 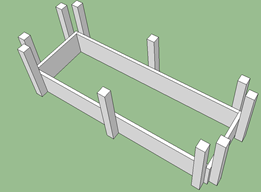 Now that the box is fastened together, you can attach it to the ten 4x4 posts. 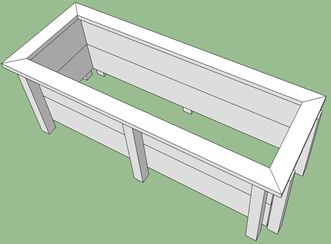 Flip the planter box over and place the  2x6x96" and 2x6x36" trapezoids on top to form a lid. Be sure that the inside edge of the 2x6s are flush with the inside edges of the 2x12s. Once in place screw the 4 trapezoids together at each end, then screw the lid into the 4x4s and 2x12s as shown. Place the planter in its location and mark where the legs will be placed. Move the planter to the side and dig the ten holes (1 for each leg) 3" deep. Be sure that the planter is level when placed in the holes. 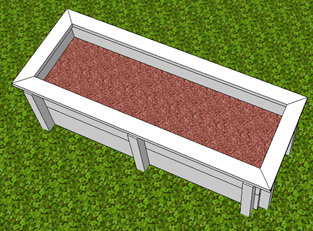 Fill the planter half way with fill material and the second half with top soil. Lastly, fill the planter with plants.